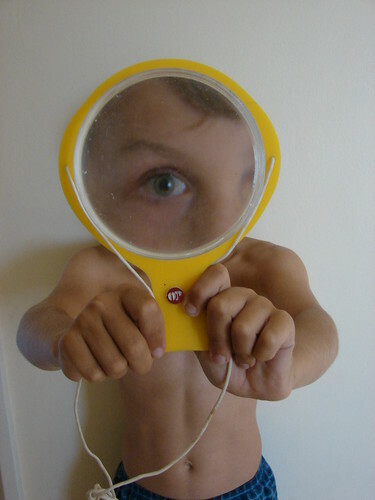 Boy with Yellow Magnifying Glass, a photo by barbourians on Flickr. My son having fun with a yellow magnifying glass. What surprises me the most is how much this photo is used by other websites. One of my objectives of using Flickr is to upload at least one Creative Commons image a day. Reuse Attribution only. I do this because I have used the Internet so much to find resources and love Creative Commons as it gives me a valid licence to use resources without breaking the law. But I’m still amazed what people search for and what images are used a lot. For example this one taken quickly in the passage with no editing or cropping. Just a yellow magnifying glass and a big eye.